Ross Brawn says he is "planning" to stay as Mercedes team principal in the wake of the emergence of plans to restructure the team. BBC Sport revealed on Tuesday that Mercedes wanted to bring in McLaren technical boss Paddy Lowe to run the team's sporting and technical aspects. Brawn said he had "talked to Paddy; we know the situation. I'm planning on being here a very long time". Asked if Mercedes were of the same mind, he said: "I hope so." Brawn did not directly answer a question about how Lowe would fit into the Mercedes team should he decide to leave McLaren, who are understood to be offering him a higher salary in an attempt to persuade him to stay. Brawn talked of Mercedes wanting him to make a "long-term commitment" but also related the situation to his time at Ferrari, when he built up the team so it could carry on winning after he left. "I know the situation completely," Brawn, who masterminded Michael Schumacher's seven world titles at Benetton and Ferrari, said. "Mercedes want a long-term commitment. And obviously with a lot of additions, I want to see how things go before I make a final long-term commitment. 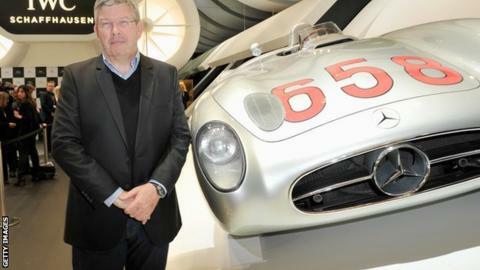 "Ross Brawn was put into a very difficult situation on Thursday and, like the wise old hand he is, he handled it well. "He said all the right things but did not persuasively mount a case that he has a long-term future at the team if McLaren technical director Paddy Lowe joins Mercedes, as new bosses Niki Lauda and Toto Wolff want him to. "There seems to be a power struggle at Mercedes now between Brawn and Wolff and Lauda and the impression, although it was denied, is of a team in turmoil. "Meanwhile, the word is that McLaren bosses Ron Dennis and Martin Whitmarsh are leaning on Lowe, who has not yet signed a contract with Mercedes, in an attempt to persuade him to stay. "A lot hangs on what Lowe decides - whoever heard of a situation where the old bosses stay in place once new ones are installed?" "It's rather like my succession plan at Ferrari. When I decided I was going to stop at Ferrari, we built a succession plan and I am part of that. I've talked to Paddy, we know the situation. I'm planning on being here a very long time." Lowe would be the fifth Mercedes employee who has been a technical director at another team, joining Brawn himself, Mercedes' technical director Bob Bell, and their two head designers Aldo Costa and Geoff Willis. Mercedes have also announced this week that Austrian Toto Wolff has become the team's executive chairman, as well as Mercedes' head of motorsport. Wolff joins fellow Austrian Niki Lauda, who is non-executive chairman and was instrumental in persuading Lewis Hamilton to join. But Brawn denied there was a problem with having too many senior people. "I am the team principal," he said. "I am in charge of sporting, technical and racing matters. "Toto is coming and there is another side of the business that quite frankly I don't want to get involved in - the commercial activities, with the support we need to give Daimler on a day-to-day basis and there's a lot of things Toto will be doing which are complimentary to what I will be doing. But you have to have one reference. Everybody knows the only way a racing team will work is to have one reference, and I'm that reference." Mercedes fell from competitiveness throughout 2012, but Brawn said he was optimistic about the team's prospects with Hamilton and Nico Rosberg this year. "We are entering a really exciting period," he said. "Obviously Lewis joining us was a massive catalyst for us all, a massive incentive, motivation. I'm seeing the maturity of the [technical] changes we made 12 months ago. "This car has been project led by Aldo [Costa] and he's done a fantastic job and I'm really excited by that. Like any of us in life, if we are excited by what we are doing we carry on doing it." He described 2012 as "painful" but added: "I believe we've made good progress over the winter. "We believe the car is a lot stronger, the focus is going to make sure that development rate, which is always ferocious in Formula 1, we can maintain. "So we're structuring the team to make sure we can maintain that - in what actually is going to be a very difficult year with [the extensive rule changes for] 2014 looming. Because 2014 is a massive change and we've got to be supporting 2014 as well as making sure of 2013."